An arrangement of white cushion mums, pink min carnations, pink rose, pink ribbons, designed in the form of a cake. 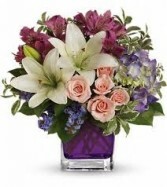 A elegant arrangement designed to celebrate that special someone in your life. This arrangement of white lilies, pink spray roses, purple hydrangea, purple statice, purple alstromeria, and mixed greenery designed in a clear glass cube is sure to be a perfect birthday surprise. 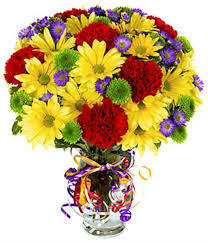 A bright colorful arrangement designed to celebrate you and your special day. This arrangement includes red carnations, yellow daisies, purple monte casino, green button poms and greenery designed in a clear glass vase accented with bright colorful curling ribbons. A colorful arrangement designed to celebrate "You" and your special day. 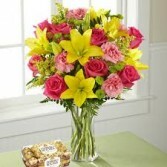 An arrangement of yellow lilies, pink roses, pink carnations, green button poms, solidago and greenery designed in a clear glass vase.